WASHINGTON (May 18, 2017) – Sen. Chuck Grassley welcomed key committee passage today of the Creating High-Quality Results and Outcomes Necessary to Improve Chronic (CHRONIC) Care Act of 2017, a bipartisan bill he co-sponsored to strengthen and improve health outcomes for Medicare beneficiaries living with chronic conditions. It extends the Independence at Home demonstration project, which allows at-home care for Medicare beneficiaries with multiple chronic illnesses. This can keep people out of nursing homes, a long-time Grassley goal. The bill allows beneficiaries receiving kidney dialysis at home to do a required monthly check-in with their doctor via telehealth rather than having to go to the doctor’s office or hospital. “This is helpful for at-home dialysis patients in rural areas,” Grassley said. It expands the use of telehealth services to Medicare Advantage enrollees. The measure expands the use of telehealth for individuals experiencing a stroke. Telestroke programs provide for rapid diagnosis and treatment to prevent death and disability in rural areas where there are no neurologists available. For example, several regional hospitals are connected to stroke specialists at the University of Iowa Hospitals and Clinics for fast consultation via video and data connection. Grassley is a cosponsor of S. 431, the Furthering Access to Stroke Telemedicine Act (FAST Act), which would also accomplish this goal. The CHRONIC CARE Act requires multiple studies, including reports on improving medication synchronization and the impact of obesity drugs on patient health and spending. Grassley is an original co-sponsor of S. 830, the Treat and Reduce Obesity Act of 2017. This legislation would give Medicare beneficiaries and their health care providers additional tools to reduce obesity by improving access to weight-loss counseling and new prescription drugs for chronic weight management. The measure includes provisions to further move Medicare Advantage toward payment for quality of care. Grassley works to make sure Medicare payment policies reward quality, not simply pay for services. WASHINGTON (May 18, 2017) – U.S. Senator Johnny Isakson, R-Ga., today applauded unanimous committee passage of bipartisan legislation he introduced to strengthen and improve health outcomes for seniors enrolled in Medicare who are living with multiple chronic conditions. The Senate Committee on Finance today passed S.870, the Creating High-quality Results and Outcomes Necessary to Improve Chronic (CHRONIC) Care Act of 2017, by a vote of 26-0. The legislation now moves to the full Senate for a vote. The CHRONIC Care Act of 2017 was introduced on April 6, 2017, by Isakson, who chairs the Senate Finance Committee’s Chronic Care working group, along with Senate Finance Committee Chairman Orrin Hatch, R-Utah, Ranking Member Ron Wyden, D-Ore., and U.S. Senator Mark Warner, D-Va., who co-chairs the working group with Isakson. Extending the proven “independence at home” model that allows seniors to receive care from primary care teams. This provision aims to decrease hospital readmissions and to allow seniors with multiple chronic conditions to receive care in their own home. Announced at a May 2015 Finance Committee hearing on chronic care, the bipartisan Chronic Care working group was formed to explore cost-effective solutions to improve health outcomes for seniors who are living with one or more chronic conditions. Isakson, a leading voice on issues relating to improved care for those with long-term health conditions, was selected along with Warner to lead the working group. The working group produced a policy options paper in December 2015 and called for stakeholder input into the groups’ ideas. The working group received 327 submissions from interested stakeholders across the country who provided thoughtful ideas on ways the Medicare program can better deliver health care to beneficiaries with multiple chronic illness. Those submissions were considered by working group members to craft a discussion draft released in October of 2016. A previous version of this bill was introduced in December 2016. Later that month, two important provisions of the legislation that improve risk adjustment and access to the successful Medicare Advantage program for Medicare-eligible individuals with end-stage renal disease were included in 21st Century Cures bill. The Creating High-quality Results and Outcomes Necessary to Improve Chronic Care Act of 2017 remains largely unchanged from the version introduced in the 114th Congress, notwithstanding minor technical and date changes. Bipartisan legislation to provide better care at lower cost for seniors unanimously passes Senate Finance Committee. WASHINGTON (May 18, 2017) – U.S. Sen. Mark R. Warner (D-VA) today applauded unanimous committee passage of bipartisan legislation he introduced with Sen. Johnny Isakson (R-GA) to strengthen and improve health outcomes for seniors enrolled in Medicare who are living with multiple chronic conditions. The CHRONIC Care Act of 2017 was introduced on April 6, 2017, by Sen. Warner and Sen. Isakson, co-chairs of the Senate Finance Committee’s Chronic Care working group, along with Senate Finance Committee Chairman Orrin Hatch (R-UT) and Ranking Member Ron Wyden (D-OR). The working group produced a policy options paper in December 2015 and called for stakeholder input into the groups’ ideas. The working group received submissions from interested stakeholders across the country who provided thoughtful ideas on ways the Medicare program can better deliver health care to beneficiaries with multiple chronic illness. Those submissions were considered by working group members to craft a discussion draft released in October of 2016. Could House Calls Be the Future of Medical Care? As politicians debate the future of the Affordable Care Act, an area doctor thinks he can see the future of medical care clearly – and it includes bringing back the old practice of house calls. As the baby-boom generation ages, chronic illnesses and fading physical ability make it more difficult for some patients to go to hospitals and doctors’ offices. And the pressure to increase the amount of doctors making house calls is rising. Pamela Herbert and her mother, Grace Rorke, spend a lot of time together, talking sports, and getting their political fix on television. And at 95 years old, Rorke’s memory hasn’t faded a bit. “I was borne in 1922, at 2922 N. Ridgeway Avenue in Chicago, Illinois, I was born in that house,” she said. But what has faded is her health. For the last several years, she’s been confined to her bed. “She started slipping and falling down,” Herbert said. “I couldn’t continue traveling to a doctor’s office. I just didn’t have the strength to do that anymore,” Rorke said. Herbert resisted placing her mother in a nursing home, and instead, she was able to find a doctor who makes house calls. Dr. Paul Chiang says he’s been making house calls for almost 18 years – in that time, he’s made more than 30,000 of them. Dr. Paul Chiang, left, and Grace Rorke, 95. Chiang is the director of Northwestern Medicine HomeCare Physicians based in Dupage County. He and the group’s founder, Dr. Thomas Cornwell, are leading the resurgence in doctors making house calls. According to Cornwell, in 1930, about 40 percent of all health care took place in the home; by 1960, that figure dropped to about 10 percent. By the 1990s, it was less than 0.5 percent. “The main reason why it dropped is because of technology,” he said. As technology advanced, x-rays, ultrasounds, CT scans, you obviously had to go to where the technology was, which was the office or the hospital,” Cornwell said. But with further advancements in technology, including portable x-ray machines and ultrasounds, doctors can put a patient’s health care in the palm of their hands. 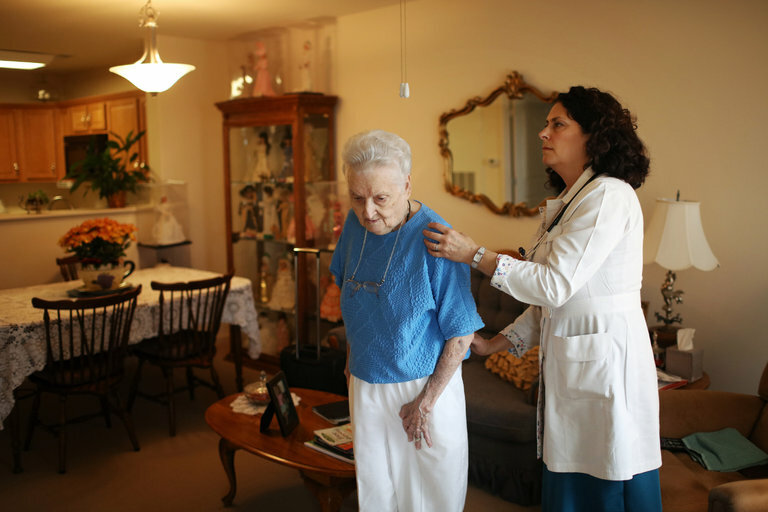 Another driver for at-home medical care: America’s aging population. As patients lose mobility, doctors say it’s not only safer for them to receive treatment at home, but less expensive in the long run. Cornwell explains that it helps that the medical community is transitioning from the current fee-for-service payment model, to a “value-based” structure. And he cites a 2007 study of the Department of Veterans Affairs home-based primary care program that showed patients had 59-percent fewer hospital days, 89-percent fewer days in the nursing home, and the 30-day hospital readmission rate went down by 21 percent. What’s more, Chiang says he’s able to treat patients holistically. “Being in your kitchen I get to learn a lot about you; about what you eat, about cleanliness. That can give me insight into things that the best test, the best equipment at the hospital cannot reveal,” he said. At her age, Grace Rorke remembers receiving house calls as a child. Today, she says, it’s saving her life. “You want to know whether I feel that my life has been extended. Yes I do,” she said. What’s more, Rorke says longevity runs in the family – so, she may need Chiang’s care for years to come. One concern of the home health care industry: the U.S. Attorney’s office here in Illinois has said that it is vulnerable to both Medicare fraud and patient abuse. Doctors Cornwell and Chiang say the profession needs more reputable medical doctors, physicians’ assistants and nurse practitioners making house calls. To that end, Cornwell runs the Home Centered Care Institute which received a $15 million grant to create six nationwide training centers at major hospitals in Washington, D.C., New York, San Francisco and right here in Chicago, at Northwestern. Michael Laff Washington, D.C. – Many patients with chronic illnesses are limited to such a degree they cannot even leave their homes to receive health care. Without proper medical attention, such patients often require repeated and expensive care. Now, she lives in a suburb of Raleigh, N.C. She still practices medicine, but has no office or clinic. Instead, she works with a Durham-based practice called Doctors Making House Calls. Grumet puts her girls on the school bus and gets in the car just before nine. Her patients are frail elderly people with multiple chronic illnesses: memory loss, heart and blood pressure problems, arthritis that makes mobility difficult. Grumet works full time, but on her own schedule. She can spend 15 minutes with a patient, or nearly two hours. She’s home before the school bus and completes her patient notes and paperwork while her girls do homework. She makes $70,000 more than she did when she worked in the Bronx. It will take some important legislative changes before focused, less intrusive care in a dignified, comfortable setting can become more widely available. The polarizing politics surrounding the Affordable Care Act makes any reform to the health care system particularly challenging. Still, given the overall popularity of Medicare — Hillary Clinton and Donald Trump both say they support it — getting a new home medical care benefit through Congress looks more promising. At the heart of the home care renaissance is a combination of high-tech, portable medical equipment and the age-old practice of doctors coming into the home to personally examine and treat their patients. 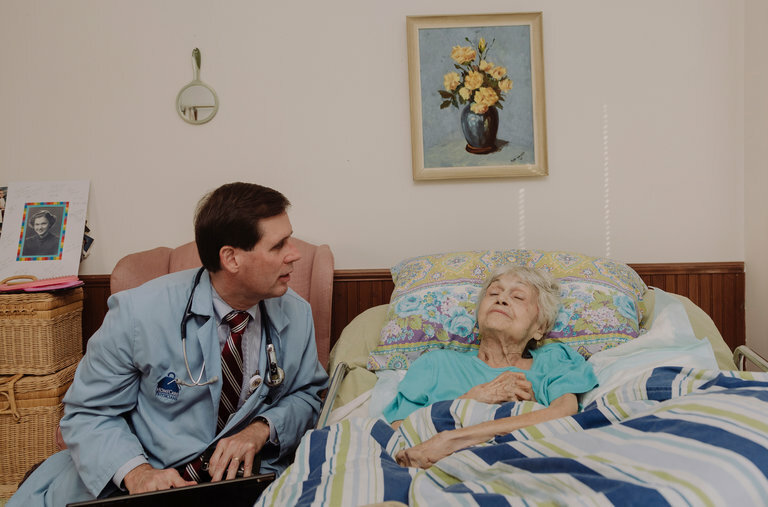 “We can do X-rays, EKGs, medical records and other applications in the home,” said Dr. Thomas Cornwell, who has made more than 32,000 house calls in his Chicago-based practice and wants to see Medicare support more home-based medical care.